What some people might call the "Diet De Jour", the Paleo Diet, emphasizes returning to a more ancestral approach to eating. It consists largely of grass-fed meat, wild fish, fresh fruit and vegetables, eggs, seeds and nuts. However processed foods, sugar, grains and dairy are avoided. So in essence, the Paleo Diet is, simply, eating proteins and plants, and staying away from chemically enhanced foods and dairy. 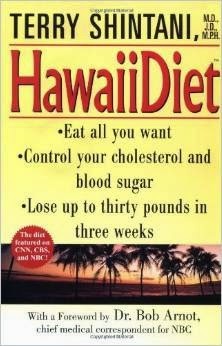 That sounds a lot like the "Hawaii Diet", a book published in 1999 by Dr. Terry Shintani, a physician interested in nutrition and traditional diets (you can read about it here), or buy it, new or used, on Amazon.com. The Ancient Hawaiians were fit. Their diet may have been one of the best in the world. It was a simple, high starch, high fiber, low saturated fat, low sodium and low cholesterol diet. They were farmers, fishermen, hunters, and gatherers who enjoyed a diversity of foods. 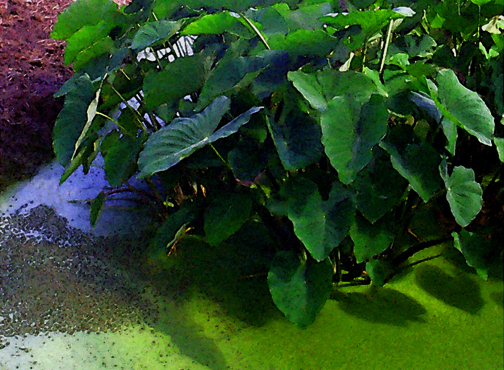 For example, they planted and irrigated taro patches, and ate their staple starch food, poi, made from pounded wetland taro root (one of the most nutritious carbohydrates known); cultivated crops such as yams, arrowroot, or breadfruit; hunted birds and pigs; gathered vines, ferns, herbs and medicinal plants from the forest; practiced both net and deep sea fishing; harvested shrimp, picked seaweed, and collected shellfish. Their main sources of protein were fish, squid, limpet, crab and other seafood including the green turtle "hono". They also ate chicken, and birds. The main leafy vegetables were taro tops (lū‘au), and edible plants such as tree fern and fan palm. Seasonings came from kukui nut, seaweed, ho'io fern and salt. They preserved food with sea salt and most foods were eaten fresh. For beverages, Hawaiians drank fresh water, coconut water, and 'awa - known as kava elsewhere in Polynesia - a slightly narcotic drink made from the 'awa root. 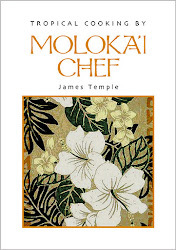 In other words, ancient Hawaiians ate whole, unprocessed, nutrient-dense, nourishing foods. They got plenty of exercise, and were family oriented. They ate well and lived well on what I call the Paleo Diet..."Hawaiian-style". The Hawaiian word for health is "ola". It also means life. Thus the word health and life was one and the same. Hawaiians obviously believed you could not have health without life, nor life without health. If you abuse your body, you abuse your spirit and mind. Being healthy means being physically, mentally and spiritually in lōkahi or harmony. Naturally I like to eat well being a cook, and I enjoy experimenting with foods that are new to me. I like my red meat, but I eat it in moderation. I concentrate on eating a balanced diet, similar to the food choices of the ancestral approach to eating. In other words not mindlessly mimicking the diets of our Paleolithic ancestors, rather being mindful of ancient dietary ways, then I make food choices that are based on health risks and consequences of the foods of our modern world. in one meal, not counting a beverage. Unfortunately Most modern Hawaiians do not follow a traditional lifestyle and, as a consequence, do not live a long time. 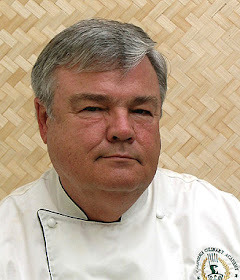 The types of food consumed in current Hawaiian culture are a mix of many different cultures of the people who call Hawaii home, food referred to as "local food". 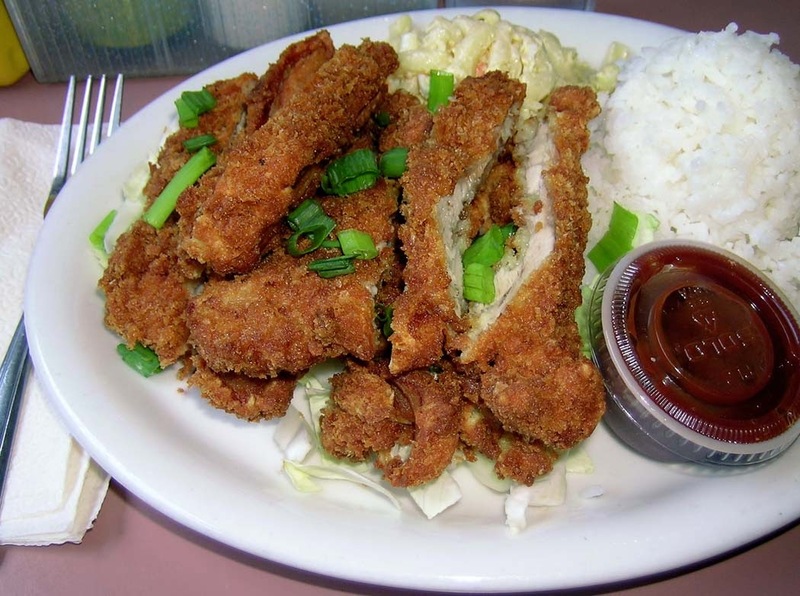 Local food consists of two scoops of rice, macaroni salad served with everything from loco moco, kalua pork, Korean barbecue, chicken katsu, beef teriyaki, Maui hot dogs, Spam musubi, manapua, Portuguese sweet bread, mochi, malasadas and many other island favorites. These foods are fattening foods, not at all like the foods that ancient Hawaiians ate. Today 34.7 percent of native Hawaiians are obese. Among Hawaii’s racial groups, Hawaiians have the highest rates of heart disease, cancer, stroke, diabetes, accidents and suicides. Life expectancy for Native Hawaiians is 6.2 years lower than the state average of 79.7 years old. 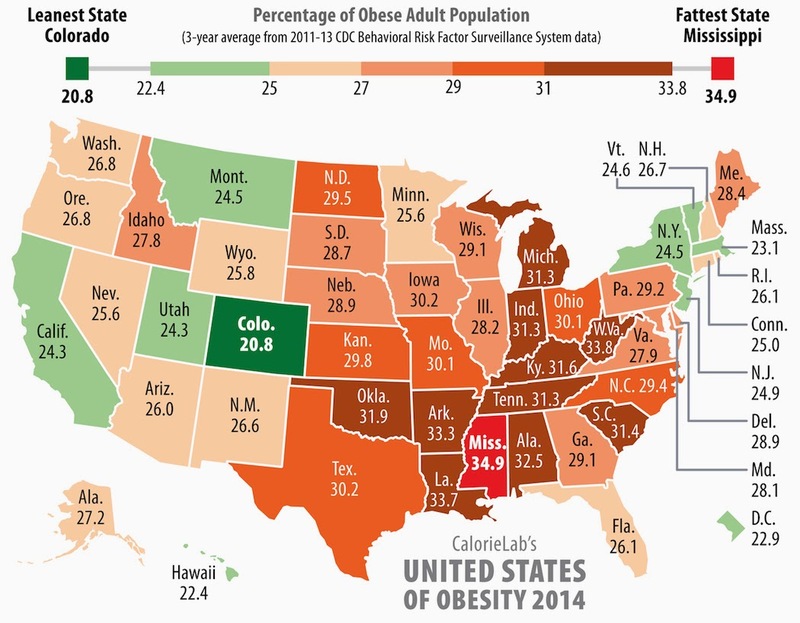 This year however, Hawaii was rated the second least obese state next to Colorado who were rated the least obese state for the fifth consecutive year. The most obese state for the ninth consecutive year is Mississippi (see chart for other states). All this says to me is that this whole country is really out of shape, including me, but then who would trust a skinny chef. It should be noted that the average lifespan in the Paleolithic era was about 35 years, but life in the wild can be challenging, especially without modern day indoor plumbing. Aloha, eat healthy, live longer! Note: If you are interested in more in-depth, and practical information on the Paleo Diet, check out this great website called nomnompaleo.com, written by Michelle Tam, a San Francisco foodie. This website, started in 2010, and now gets 100,000 hits a day according to CBS news this morning. Hawaii is in love with sweet bread, like they bake here on Moloka'i at Kanemitsu's Bakery. Sweet bread is great, but I spent many years in San Francisco, Ca., and got a taste for crusty bread. They call it "Artisan" bread now, but crusty bread is crusty bread, and as everybody knows who have been to San Francisco, the bread is crusty, whether sour dough or sweet, and is to die for. Here on Moloka'i, the only way to get crusty bread is to visit Moloka'i Wines & Spirits where they sell par-baked frozen bread shipped here from where else, San Francisco. Don't get me wrong, there's nothing wrong with this bread, it's actually pretty good, but it's still not as good as made from scratch crusty bread. In a large ceramic bowl, combine the flour, yeast and salt. Add water and stir until blended; the dough will be shaggy and very sticky. Cover tightly with plastic wrap. Let the dough rest at room temperature until the surface is dotted with bubbles, 12 to 18 hours. Turn the dough out onto a lightly floured work surface. Sprinkle with a little flour. Using a pastry scraper fold over onto itself once or twice. Cover loosely with plastic wrap and allow to rest for 15 minutes. Generously coat a cotton flour sack towel with cornmeal and drape inside a ceramic bowl. Do not use a terry cloth towel. Using just enough flour to keep the dough from sticking to the work surface or your fingers, gently and quickly shape the dough into a ball. Put the dough, seam side down, on the towel in the bowl and dust with more flour or cornmeal. Cover with another cotton towel and let rise until the dough is more than double in size and does not readily spring back when poked with a finger, 2 to 5 hours depending on room temperature. 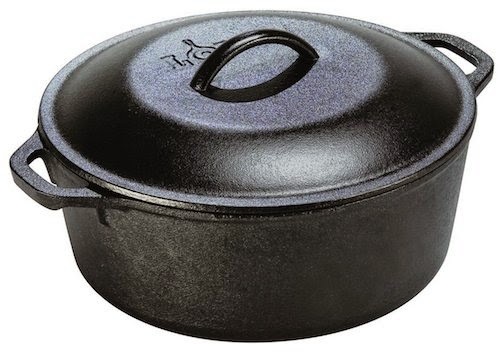 It's important to heat the Dutch oven first before putting the dough in it, therefore, put a 2 3/4 quart cast-iron or similar pot in your oven and preheat to 450˚F. Carefully remove the pot from the oven. Slide your hand under the towel and turn the dough over, seam side up, into the hot pot. Shake the pot once or twice to help distribute the dough if necessary. The dough will rise as it bakes. Cover with the lid and bake for 30 minutes. Uncover and continue baking until the loaf is browned and reaches an internal temperature of 200˚F - 210˚F, 15 to 30 minutes more. Transfer the pot to a wire rack and let cool for 10 minutes. Using oven mitts, put the pot on its side and gently turn the bread, it will release easily. Makes one 1 1/2 pound loaf. Note: You should use a ceramic bowl rather than metal. The ceramic bowl will help the yeast retain the heat it's generating and make more air bubbles in the bread. Weighing the flour has resulted in a more consistent loaf for me, however most recipes call for 3 cups of flour. If you have leftover bread and you want to use it again later, simply put it in a zip-lock freezer bag and freeze it. To reheat it, preheat the oven to 425˚F and bake for 15 minutes. The beautiful sunflower's center head is loaded with seeds, about 1500. Actually they are not seeds at all, but rather the fruit of the sunflower. They are a popular snack across the U.S., and around the world. I buy them raw, without the outer shell, and roast them at home. After you try my simple recipe below, you will understand why I call these little seeds "addictive". I flavor them in sweetened, savory Tamari soy sauce, with a little chili seasoning, transforming them into my favorite out-of-hand snack that goes really well with a cold beer on a hot Hawaiian day. Try adding dried cranberries to them for an energy snack, or use them sprinkled on a fruit salads, pastas, rice, stir-fries, casseroles, bake them into bread, rolls, or biscuits, or on top of Hawaiian ahi poke. Sunflower seeds are packed with nutrients. Whether roasted or raw, they provide ample amounts of protein-building amino acids, along with magnesium, potassium, zinc and Vitamin E. In fact, a quarter-cup serving provides 90 percent of daily Vitamin E requirements, which helps prevent asthma, arthritis, colon cancer and cardiovascular disease. Magnesium promotes a healthy immune system and strong bones, potassium improves kidney functioning, and zinc supports healthy overall growth. Even when roasted, these kernels lose only a minimal amount of vitamins and minerals, and still pack a powerful health punch. Sunflower seeds make a nice addition to any well-balanced diet, however they should be enjoyed in moderation due to their high caloric content. One ounce of sunflower seeds has 160 calories, which is overshadowed by so many other healthy benefits. The sunflower is not a genetically modified plant (non-GMO). Europe is a large production region for sunflower and the EU will not accept GMO planting seed. The regulatory hurdles in the U.S. are insurmountable at the present time due to possible gene flow to wild sunflower. Without Europe and the U.S. there is not enough market size for the private sector to make the necessary investment in sunflower GMO. These raw, sunflower seed kernels are usually available in most grocery stores, or at Friendly Market here on Moloka'i. Their are many brand names, but I use "Health Best", $3.69 for a 14 ounce bag (about 2 1/2 cups), or you can buy many other brands online at amazon.com. This is my favorite way to prepare them, however check out this site for many other recipe ideas. Place a rack in the center of the oven and preheat to 350˚F. In a bowl, blend brown sugar, Tamari soy sauce, water and Togarashi seasoning until sugar has dissolved. Put seeds in the bowl and mix with a spoon several times so that all of the seeds are totally coated. Let sit for 5 minutes, then stir again. Spread the sunflower seeds evenly on a large baking sheet. Roast for 18 minutes, turning once with a spatula halfway, until the seeds turn a golden color. Watch closely so that the seeds don't burn. Place the baking sheet on top of the stove to cool for about 30 minutes. At this point, taste the seeds, and sprinkle more Togarashi seasoning on if you like the seeds spicier. Store in glass jar with a tight-fitting lid for up to a week, however they won't last that long. Makes about 2 1/2 cups. *Note: Nanami Togarashi is a spicy powdered assortment of dried chili peppers and other seasonings including orange peel, sesame seeds, Japanese pepper, ginger and seaweed, and is usually available in the Asian section of your grocery store, or on Amazon.com. This product is also available at Friendly Market here on Moloka'i in the Asian section. I always have this little bottle in my spice cabinet, it's great sprinkled on top of so many things, like saimin noodle soup, rice, or ahi poke. Add a little spice to your life. What tops off this beautiful roasted beet salad is a honey sweet balsamic vinaigrette and roasted sunflower seeds, all on a bed of watercress leaves. 1 1/2 pounds red beets, medium sized, scrubbed clean, green tops removed. Preheat oven to 350˚F. Place rack in the middle of the oven. Line a roasting pan with aluminum foil. Place the beets in the pan. Rub olive oil over the beets, and sprinkle with salt. Cover the beets with another sheet of aluminum foil, crunching up the sides of the aluminum foil together to seal. Roast for 1 to 2 hours (depending on the size of the beets) or until tender and easily pierced with the tip of a paring knife. Remove from oven and take off the top foil. Set aside to cool enough to handle. When cool, peel the skin off. They should peel easily by hand, but you can use a paring knife if you want. Cut the beets into 1/4 inch slices. Refrigerate covered until you are ready to serve. While the beets are cooling, make the vinaigrette by simply combining the ingredients in a small bowl or jar and refrigerate until ready to serve. When you are ready to serve, divide and arrange the watercress leaves into 4 bunches on chilled salad plates. Place cold beet slices on top of the watercress, overlapping each slice in a circle. Season the salad with the vinaigrette and sprinkle roasted sunflower seeds over the top of the beets. Makes 4 servings. Note: Always look for fresh beets with big bushy tops. That way you know the beets are fresh, and the tops are very similar to the taste of spinach. I usually sauté the tops in a little chicken stock or water, with a little sliced onion, garlic, and a little salt for about 5 minutes. Beet greens cook quickly, so take care not to overcook them. Serve hot with a little splash of red wine vinegar or balsamic vinegar and a sprinkling of roasted sunflower seeds. One big bunch of beet tops will make 2 servings, however they will cook down quite a lot. I always buy extra because they are so good. Kumu Farms usually have beautiful fresh beets and tops here on Moloka'i (see photo above). Sushi lovers in Hawaii and all over the world, know all about this strange looking volatile green condiment paste that stimulates their nasal passages. It is typically served in nori rolls, or mixed into Tamari soy dipping sauce. Wasabi, also called Japanese horseradish, is a relative of the familiar white horseradish sauce used in our classic bloody marys or served along side prime rib here in the U.S.
Fresh green wasabi root is rarely seen in the U.S. because the plant grows next to highland mountain streams in Japan. 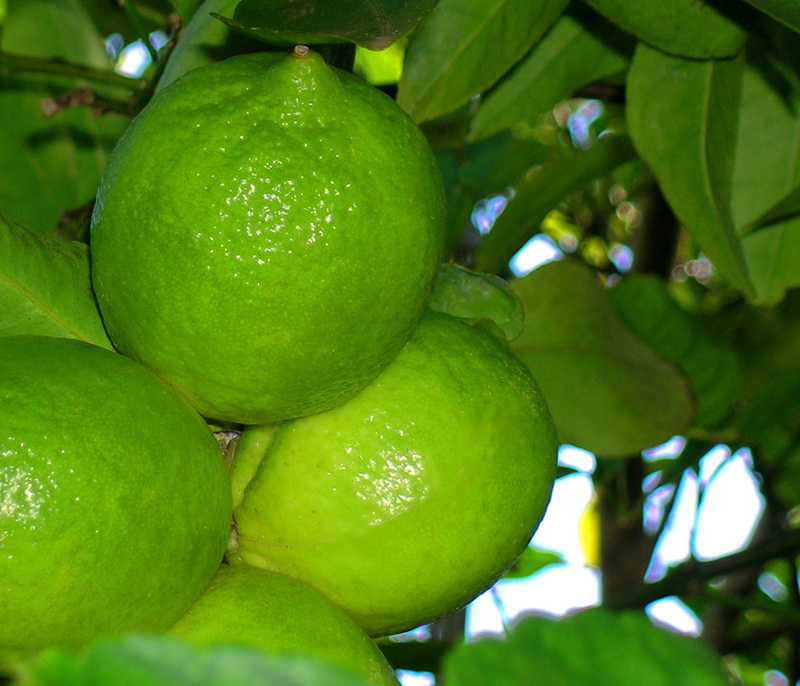 It takes two years to reach maturity and is very perishable and therefore expensive to ship far from its growing patch. Actually to refer to the part used for wasabi as a root is actually incorrect, in fact the stem of the plant is the only part Japanese wasabi paste comes from. In some high-end sushi restaurants, the paste is prepared when the customer orders, and is made using a grater to grate the stem; once the paste is prepared, it loses flavor in 15 minutes if left uncovered. The wasabi we have seen served in many sushi bars in this country is probably not from the Japanese plant, but rather from Western horseradish mixed with mustard or daikon radish mixed with cornstarch or potato starch, that act as a binding agent. Cornstarch is chemically extracted and bleached. Both cornstarch and potato starch are commonly polluted with GEOs (genetically modified organisms). Most commercial wasabi powder is made with a mixture of blue and yellow dyes, to give it the classic green color of real wasabi. 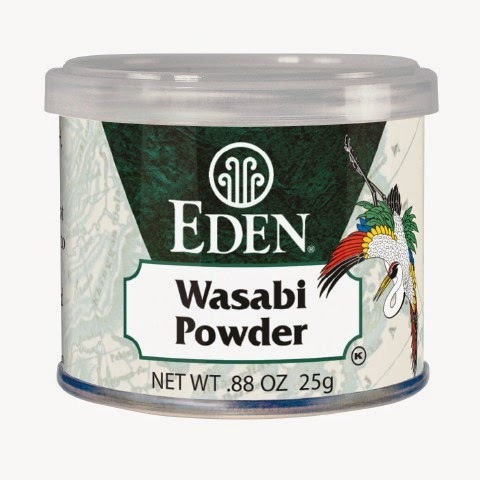 However for the purest foodie like me, there is an excellent, potent, wasabi powder that is completely natural and contains no dyes, starches, or preservatives. It is made with horseradish, mustard, and real Japanese wasabi, and is sold online by Eden Foods, Inc. (click here for more information or to purchase). Also thespicehouse.com sells "Namida Pure Wasabi Powder" for their "discerning" customers, at a little higher price than their more conventional blended wasabi powder. Pat the Ahi dry, then neatly cut it into small 1/2 inch cubes. Place in a bowl. Add the shallots, green onion, Tamari soy sauce, sesame oil, wasabi paste, honey and sesame seeds. Gently toss. Serve immediately or cover and refrigerate. Makes 6-8 servings. Not only a great dish anytime, but a great diet dish. Serve it in martini glasses like they do at the top restaurants, and this simple fish preparation becomes a luxury experience. You can also serve it with cocktails in shot glasses, with small seafood forks. 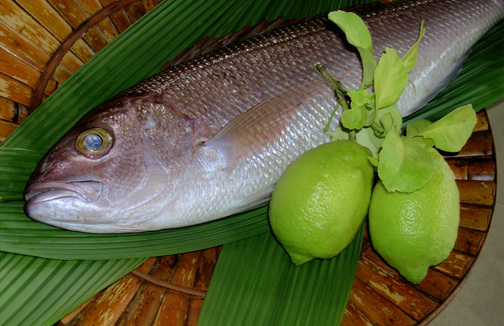 The citrus juice (citric acid) cures the fish: you will see it change from translucent, raw fish cubes to white, “cooked” fish. 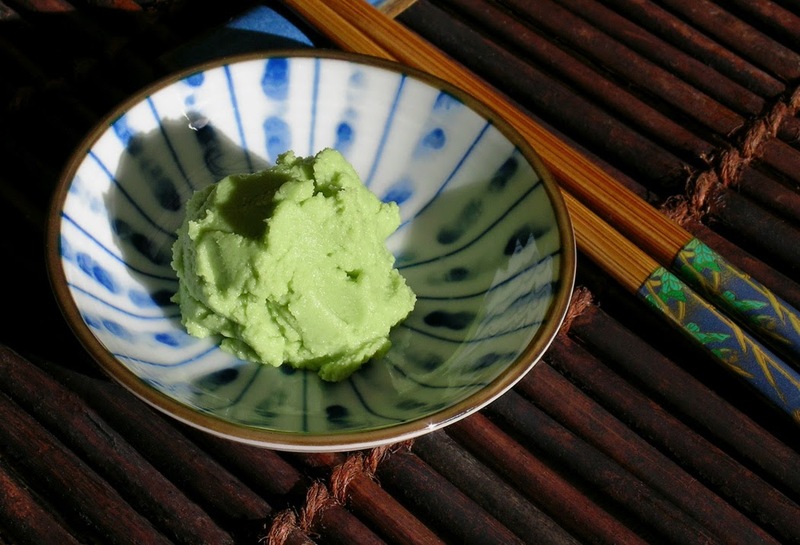 Here, wasabi paste substitutes for the traditional serrano chile. You can serve this dish as a first course with a few gourmet tortilla chips (try blue corn) or thin slices of garlic bread. *Classic ceviche is all white fish, but we enjoy the variety of shrimp and scallops. Combine the fish, onion, tomatoes, Wasabi paste, salt, and hot sauce in a glass or ceramic dish (don’t use metal). Cover with lime and lemon juice, coating fish thoroughly. Leave covered in the refrigerator for an hour, then stir again to ensure thorough coating of fish with the citrus juice. Let the mixture sit for at least 6 hours, giving time for the flavors to blend. Garnish with an avocado slice and chopped cilantro. Makes 4 servings. This simple sauce is wonderful over salmon burgers, with fish tacos, or in a maki roll. Combine everything in a bowl. Cover and refrigerate until ready to use. This is a versatile and tasty sauce for fish, beef, sandwiches, or vegetables. Whip the cream, mix in the Wasabi paste. Add the lime juice and salt. Add the parsley just before serving. In a small bowl, whisk together the lime juice and wasabi powder. let stand for five minutes. Whisk in the remaining ingredients until well blended. Use on any combination of Asian salad ingredients such as Chinese chicken salad, or pear salad with spinach, red onion, topped with slivered almonds, or on an Asian cole slaw with shredded napa cabbage, radishes, carrots, red onion, avocado and chives, topped with roast pork and sesame seeds, or simply on thinly sliced Japanese cucumber with toasted sesame seeds. Makes 1/2 cup of dressing. Cook noodles according to package instructions. Drain noodles. While still warm, gently toss with 4 ounces of dressing/marinade. Gently! Cover and refrigerate until cooled. Once cool, add chopped cucumber, toasted sesame seeds. Gently toss to incorporate. Garnish with fresh cilantro, if desired. Makes 2 servings. Meanwhile, for wasabi oil, in small bowl combine Wasabi paste, water, oil, vinegar, and sugar. Whisk to combine. Serve pork and vegetables on tortillas. Drizzle with wasabi oil. Serve immediately. Makes 6 servings. Note: Soak skewers 30 minutes before using. Place the first four ingredients into a small bowl and whisk to dissolve the wasabi. Preheat the oven to 400˚F. Place the asparagus spears on a baking sheet and evenly brush the wasabi mixture over the asparagus. Bake for about 15 minutes until tender. Remove, place on a serving platter and sprinkle with a pinch of sea salt if desired. Makes 4 servings. Variation: place the seasoned spears on a hot grill and grill for 2 to 3 minutes. Turn and grill another 2 minutes or until tender. They can also be broiled in a similar manner on a baking sheet. Add broth, tamari, carrots, bok choy, noodles, Wasabi paste to pot with onions and garlic. Bring the pot to a boil, then cover and simmer for 15-20 minutes. Serve with a pinch of Scichimi Togarashi spice. Makes 2 servings. Note: “Shichimi Togarashi” (or simply “Shichimi”) is a Japanese chilli-based condiment. As the word of “Shichimi” means “seven tastes”, its blend includes several spices like red chilli pepper, black sansho pepper, dried mikan orange peel, black sesame seeds, poppy seeds, nori (dried seaweed) and hemp seeds. Being available in most supermarkets, Shichimi is used to spice up not only hot noodles, but yakitori and other savoury dishes. I love the stuff! Fill a tall glass with ice and add the sake. Mix the pickled ginger, shichimi, Wasabi paste and soy sauce in a small dish. Add this mixture to the glass. Top up with the tomato juice. Add salt and pepper to taste and serve. Makes one cocktail. ...with Lots of Good Food! Starfruit are usually harvested October thru December in Hawai'i, just in time to try this beautiful recipe during the Holidays. 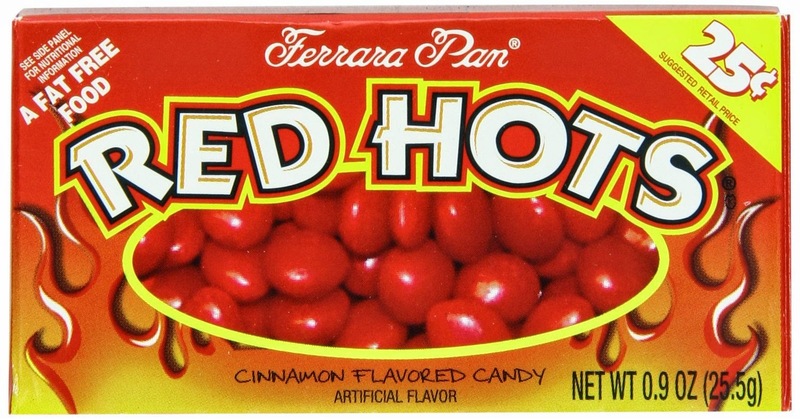 Traditionally this recipe used old fashioned Red Hots cinnamon candy and canned peaches studded with whole cloves, but starfruit are more festive than peaches, and more Hawaiian. These delicious candied starfruit pickles are great as a garnish for a festive Holiday drink (1 part vodka or white rum, 2 parts juice from the jar, a squeeze of lime, and ice). Use them as part of a tropical dessert, perhaps served with other fruit like fresh pineapple and grapes, or serve on top of hot oatmeal on a cold morning, or simply given as a gift with a bow. 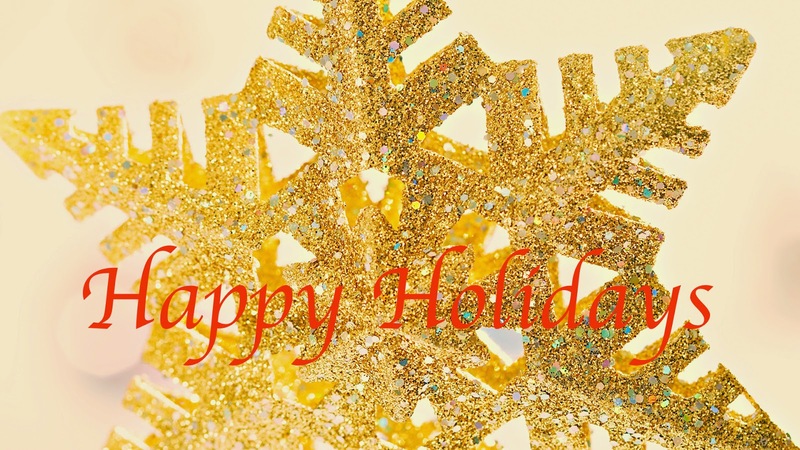 Enjoy, and Happy Holidays! 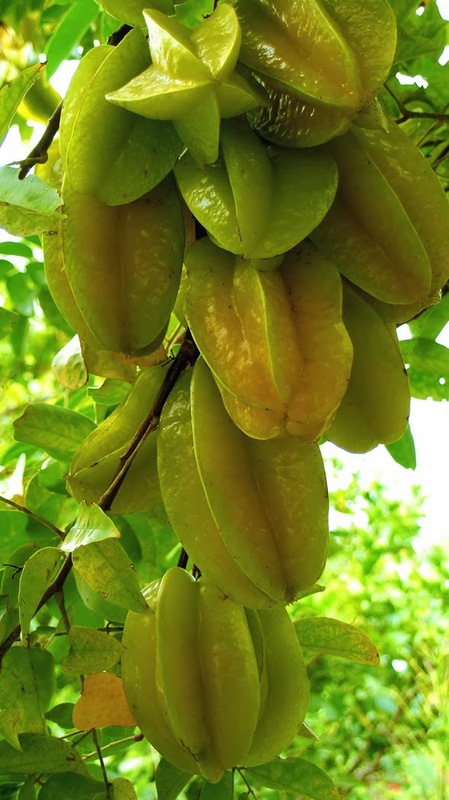 For more starfruit recipes, click here. These holiday honey muffins are a wonderful combination of flavors, perfect for gifts, or just eaten Christmas morning with a mug of hot honey apple cider. Preheat oven to 325°. In a small bowl, soak the cranberries in the bourbon and set aside. Line 2- 12 cup muffin tins with paper liners. In a large bowl, sift together flour, baking powder, baking soda and salt. In another large bowl, beat the egg yolks and sugar with an electric mixer until thick. Whisk together the honey, coffee and orange rind and slowly stir it into the egg yolk mixture. Stir in the cranberries, bourbon and pecans. Fold in the flour mixture. Beat egg whites until stiff but not dry and fold into the batter. Spoon into muffin cups until each is about 2/3 full. Bake 25-30 minutes or until a cake tester comes out clean. Cool pans on a wire rack about 10 minutes. Remove the honey muffins from the pans and cool completely. Cream butter and shortening until fluffy. Add honey and cinnamon and blend. Slowly add powdered sugar 1 cup at a time and beat for about 3-5 minutes, until desired consistency. If it gets too thick, add 1-2 tablespoons of milk. If too runny, add a little bit more powdered sugar. Pipe or spread on top of each muffin. Note: This is a really rich frosting, so if you like it less sweet, I recommend just a tiny amount on each muffin. Makes 24 honey muffins. Living 1200 feet above sea level here in Hawaii, hot honey apple cider really hits the spot on cold winter nights. If you are really cold, add a shot of whisky to warm the cockles of your heart. In a saucepan combine all ingredients. Simmer 20 minutes. Strain into mugs and garnish each mug with a cinnamon stick. Makes 8 servings. 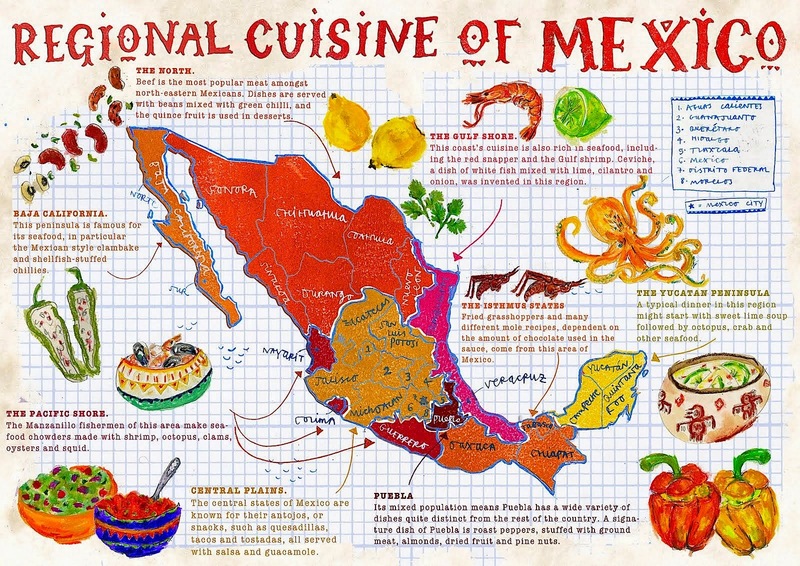 The cuisine of Mexico is very different than Hawaii's cuisine however Hawaii and Mexico have a lot in common. Hawaii's eight main islands lie in the tropics and share the same latitude as Mexico City. Mexico's weather is quite similar to Hawaii with sunshine and warmth all year, except for hurricane season when Mexico airmails her storms to us. We both have our traditions, great and varied foods, music, dancing from many cultures, art work and celebrations depict past to present. Both cultures are family-oriented, elderly are respected, and you are definitely judged and accepted by the quality of your heart and soul rather than your net worth. Hawaii's Hispanic community is small, but growing. Hawaii now has about 38,700 Mexican-origin residents, up 165 percent from 14,600 in 1990. Two-thirds of Hawaii's Mexican-origin residents live on the island of Oahu. If you live or visit the island of Oahu and are craving some good Mexican food, I would recommend "Los Chaparros" 2140 S Beretania St, Honolulu, (808) 951-6399. Los Chaparros is a casual restaurant that has an extensive menu of Mexican entrees as well as other popular appetizers, salads, soups, and tortas. Breakfast favorites such as Huevos con Chorizo are also available all day long. Desserts include flan, bread pudding, churros and banana flautas. Housemade horchata and the fire roasted salsa with chips are always in high demand. The bar offering includes Mexican beer, wine, sangria, tequila and margaritas. Daily drink specials and weekday lunch specials are also available, menu price range: $11-30. Unfortunately the island I live on, Moloka'i, which is right next to Oahu, has very few Hispanic residents, which explains why there are no Mexican restaurants here. The closest thing to Mexican food on Moloka'i is the $16.99 Nacho Grande, during Wednesday's Mexican night at Pizza Cafe. If you're like me, that will just not do. If you love Mexican cuisine as I do, you have to plan ahead, order the ingredients online, if you have to, then make your own Mexican food. 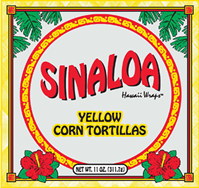 Fortunately Sinaloa tortillas are available here in Hawaii, made on Oahu, and are available on most islands, including Moloka'i. That means you can throw together a taco or burrito without too much trouble. It's the Mexican spices and cheeses that are the problem. I usually order most of my spices from www.penzeys.com, or from www.thespicehouse.com. There are other sources online for spices if you take the time to look, this one, MexGrocer.com, will ship via Priority Mail to Hawaii with no minimum order. Here are a few of my favorite Mexican recipes, or click here for Paniolo recipes, or for even more delicious Mexican and Tex Mex recipes, check out this site. Mexican ceviche is sort of like poke here in Hawaii. Raw fish marinated in a sauce with onions or whatever else you like. The difference is that Mexican ceviche relies on fresh lime juice to chemically cook the fish, giving it a wonderful lime flavor. Naturally small Mexican limes are the best for this recipe, but our Tahitian limes here in Hawaii work mighty fine. Juice the limes in a bowl and then add the mahi-mahi. Chop the onion into 1/2-inch pieces and add to the bowl along with the oregano and cilantro. Toss the ingredients until fish is well coated. Place the bowl with the fish in the refrigerator, covered for at least 1 hour. Remove from the refrigerator, add the avocado, tomatoes, salt to taste, and chiles if using. Toss and serve with tortilla chips or in a soft tortilla. Makes 6-8 servings depending on how hungry you are. Note: To make limes or lemons easier to juice, put them in the microwave before slicing for about 20 to 30 seconds before squeezing, then when they have cooled for 30 seconds, roll them on the counter top with your hand, then cut them open for more juice. This kind of salsa is called salsa roja or red sauce. It's very much like the tex-mex salsa you get at your favorite Mexican restaurant, served with corn chips. If you've never had homemade salsa then you must give this a try. 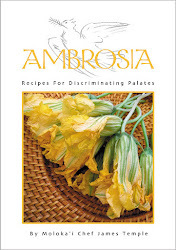 This is a wonderful recipe from my first cookbook. The brining brings out so much flavor in the shrimp and leaving the shells on the shrimp keeps them moist... the spicy sauce is to die for! Clean shrimp with kitchen sheers. It's important to leave the shells on to retain moisture. Run the tip of the sheers up the back of the shrimp and remove the vein. Snip off small legs under shrimp. Prepare brining solution in a medium size bowl, mix well. Add the shrimp and let soak for 30 minutes and up to 3 hours in the refrigerator. Remove shrimp from the brining solution and pat very dry, set aside. While the shrimp are brining, make the paste. Using mortar and pestle, smash garlic and salt into a smooth paste. Add cayenne and paprika and mix well. Add olive oil, ginger, and lemon to form a thin paste, making sure the paste isn’t too loose or it will not cling to the shrimp. Toss shrimp with paste until evenly coated. Refrigerate until ready to grill. Grill until shells are bright pink, about 2 to 3 minutes per side. Serve hot over Mexican cabbage slaw (recipe below). Makes 8 appetizer servings. Note: I like to put the shrimp on skewers unless the shrimp are very large because it makes turning them so quick and easy. Grill on a lightly oiled rack. It's better to grill the shrimp using charcoal rather than gas, the flavor is better. Grill over medium-high heat. I like this simple breakfast dish using tortilla chips instead of whole tortillas. Preheat the oven to 400°F. In a saucepan, heat the olive oil. Add the onion, bell pepper, jalapeño, garlic and oregano. Season with salt and pepper and cook over high heat, stirring, until lightly browned, 5 minutes. Add the tomato sauce and water and simmer for 5 minutes, until slightly thickened. Spoon the sauce into 4 individual, shallow baking dishes and arrange the tortilla chips around the sides. Crack 2 eggs into each dish and sprinkle with the cheese. Set the dishes on a baking sheet and bake for 15 to 20 minutes, until the egg whites are set and the yolks are still runny. Sprinkle with cilantro and serve right away. Makes 4 servings. "Curtido" an easy, and delicious Mexican cabbage slaw used as a side dish for one of the Mexican recipes found here on Tasting Hawaii. In a large bowl, toss together cabbage, onion, carrot, and jalapeño, if using. In a small saucepan, combine vinegar, salt, and sugar a cook over medium heat, stirring, until salt and sugar are just dissolved. Pour hot brine over vegetables and toss to combine. Cover and refrigerate for one hour before serving. Makes about 5 cups. Heat 1 tablespoon of the oil in a medium skillet over medium heat. Add the onion and 1/4 teaspoon each salt and pepper and cook, stirring occasionally, until soft, 4 to 5 minutes. Add the chicken and chilies and cook until warmed through, 2 to 3 minutes more. Meanwhile, heat the remaining tablespoon of oil in a small saucepan over medium heat. Add the beans and scallion whites and cook until warmed through, 3 to 4 minutes. Stir in the vinegar. Divide the chicken mixture among the heated taco shells and serve with beans, and top with salsa. Sprinkle with the scallion greens. Makes 4 servings of 2 tacos each. Note: Use fresh corn tortillas. Either fry them in a skillet with a little oil until just slightly browned, or put foil over them and heat in a 300˚F oven for about 10 minutes, or until just heated through. You can also add a dollop of sour cream, and shredded cheddar cheese on each taco if you wish. This recipe is so easy, and I highly recommend this brand of Nalley's chili. It gives the burrito just the right amount of heat and beans (you can buy it at Friendly Market here on Moloka'i). I also like to use napa cabbage instead of lettuce, because it stays crisp. In a large skillet, cook beef and onion over medium heat until meat is well done; drain. Stir in chili and simmer, uncovered, for 5 minutes. Take each tortilla and heat it on the burner of your stove, turning and flipping until it is hot. Put the hot tortilla on a plate and brush one side with melted butter. Place about 1/4 cup of the meat mixture in a line on top of the buttered tortilla. Put a little shredded cabbage on top of the meat followed by a little cheese and a dollop of sour cream. Roll the closest edge of the tortilla over the filling. Fold in the left and right sides, then continue to roll the entire burrito over so that the sides are tucked in the rolled up burrito. Place the chili beef burrito, seam side down on a plate and serve with cold orange sections displayed on a nappa cabbage leaf. Makes 8 servings. Note: You can add other things to the burrito if you like, like rice, avocado, black olives, salsa, etc. 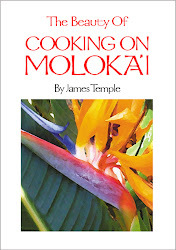 You can't find corn husks or masa harina where I live on Moloka'i, but you can order them online (click on the link below the photo on the right). Masa flour is NOT regular corn meal. Other than getting those two things, this is an easy recipe. If you have leftover slow braised pork, you can use that instead of chicken. 2 1/2 cups shredded roast chicken. In a food processor, pulse the masa harina with the baking powder and salt. Add the water and pulse to moisten the masa harina. Add the vegetable shortening in clumps and drizzle with the chicken stock. Process until smooth and evenly blended, scraping the side of the bowl occasionally. Transfer the dough to a large bowl and stir in the shredded chicken, shredded cheese, chopped cilantro and scallions. Tear twelve 12-inch-square sheets of plastic wrap (normally water soaked dried corn husks shells are used for tamales). Working with 6 at a time, spoon a scant 1/2 cup of the tamale mixture onto the center of each sheet. With lightly moistened hands, press the tamales into 4-by-2-inch rectangles, about 1/2 inch thick. Place one teaspoon of red sauce over the top of each tamale. 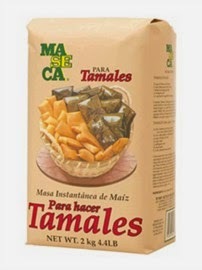 Fold up the squares of plastic around the tamales, twist the ends securely and then fold them under to make packets. Repeat to form the remaining tamales. Arrange the tamales seam side down in the bottom of a large bamboo (or other) steamer. Steam over 2 inches of boiling water for 25 minutes. Let the tamales cool slightly, then carefully transfer them to a large platter: Cut the ends of the plastic-wrapped packets and slide the tamales out onto the platter. Serve the tamales with Mexican cabbage slaw (recipe above). Makes 6 servings. Prepare your red enchilada sauce, (recipe below). In large skillet, heat oil over medium-high heat. Add onion and saute for 3 minutes, stirring occasionally. Add diced chicken and green chiles, a sprinkle of corn, and season with salt and pepper. Saute for 6-8 minutes, stirring occasionally, or until the chicken is cooked through. Remove from heat and set aside. To assemble the enchiladas, set up an assembly line including: tortillas, red enchilada sauce, chicken mixture, and cheese. Lay out a tortilla, and spread two tablespoons of sauce over the surface of the tortilla. Add a spoonful of the chicken mixture, then sprinkle with 1/3 cup cheese. Roll up tortilla and place in a greased 9 x 13-inch baking dish. Repeat with the remaining ingredients. Then spread the remaining enchilada sauce on top of the tortillas, and sprinkle with shredded cheese. Bake uncovered in a 350˚F oven for 20 minutes. Remove from oven and serve immediately, garnished with chopped fresh cilantro. Makes 4-6 servings. Note: I always serve my enchiladas with refried beans (see recipe below) and a small salad on the side. 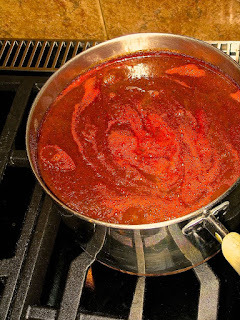 I'm a big fan of chicken enchiladas, and this homemade red enchilada sauce is way better than anything you can buy in the can, and easy to make as well! The red enchilada sauce is the key to this recipe and should be made in advance so that all of the flavors can meld. I make a big batch and freeze what I don't use in plastic ice cream containers so I always have some on hand. It freezes well for up to 6 months: just reheat on the stove top when you're ready to use it. I usually buy a 16 ounce bag of Guajillo Chili Powder from a great online spice company called My Spice Sage, for the base of my red enchilada sauce. This chili powder is one of the more mild chile peppers and is smoky, tangy, rich, warm and complex in flavor. Place all ingredients in a large saucepan. Bring to a simmer for 15 minutes then remove from heat and cover. Let stand covered for 1 hour. Heat the oil in a large skillet. Add the Mexican oregano, cumin, and garlic. Stir in the oil a few minutes until fragrant. Soak the corn cobs in salted water for at least 1 hour, so the husks don't burn when you grill them. To make the butter, put the chile peppers on a baking sheet and bake them until very brittle, about 15 minutes. When they are done, remove and cool them. Remove the seeds and crumble the chiles into a food processor. Add the butter and spices and process until combined. Lay out a sheet of plastic wrap on top of a sheet of foil. Turn the butter out onto the wrap and roll it into a cylinder. First wrap the plastic wrap around the cylinder and then secure the foil around it. Twist the ends, gradually applying more pressure as you twist, in order to make the cylinder taught. Alternatively, pile the butter into ramekins and cover with plastic wrap. Refrigerate it until firm. Preheat a grill to medium-high heat. Remove the corn from the water and shake or pat them dry. Grill the corn on the cob for 30 to 40 minutes, turning frequently. The corn is done when it feels soft when you press on it. Take the corn off the grill and carefully peel back the husks (it will be hot). Remove the corn silk and tie the husks in a knot so you can hold on to it like a handle. Lay slices of the chilled chile butter on and let it melt. The corn will have beautiful flecks of chile. Or serve the ramekins on the dinner table for everyone to help themselves. Makes 8 servings. Grilling is all about flavor. Add an apricot spicy glaze and you've got a winner. Prepare your grill for both indirect and direct grilling. Remove chicken from fridge about 1/2 hour before you’re ready to cook and trim excess skin and fat. Set aside on counter. If you’re using charcoal, you can do this when you start the coals. Combine preserves, Sriracha, rice vinegar and fish sauce in a medium bowl, mashing out any lumps in the preserves with the tines of a fork. Stir in the chives. Taste and if it isn't to hot for your taste, add the chili sauce to the mix. When the grill is ready, pat chicken dry with paper towels and season with black pepper, and lightly with salt. Brush the grill rack lightly with oil and place chicken skin side up on the side of the grill away from the heat source. Cover the grill and cook chicken for about 5 minutes; this will render some of the fat. Move chicken directly over the coals skin side down, cover grill and cook until skin begins to crisp and brown, about 5 minutes (or longer, if needed). Move chicken away from heat and turn skin side up. Brush with basting sauce, cover grill and cook, turning every few minutes and basting, until chicken is cooked through, another 10 to 15 minutes. An instant-read thermometer should register 165ºF when inserted in the thickest part. Transfer chicken to platter and let it rest for 5 minutes or so, then serve. Makes 4 servings. The trick to good Spanish rice is to brown the raw rice first with onions and garlic, and then cook the rice in chicken stock with added tomatoes. Browning the rice gives it a nutty flavor. I like these refried beans because they are quick and easy, and they taste good. I use a potato masher to smash the beans in the bottom of the pot. You can garnish this side dish with cheese and/or chopped green onion. Personally, I like them without garnish like they serve in Mexican restaurants. Flan is an oven-baked caramel custard dessert that is very popular in Spain and in Mexico. Flan is commonly used as a term to describe the Spanish or Mexican version of Crème caramel. However, traditional flan is both more rich and more dense than Crème caramel, as it contains more eggs and yolks as well as some milk, heavy cream, half and half, and/or sweetened condensed milk. It is made with a top layer of custard paired with the sweetness of a light caramel sauce, that is put in the bottom of the pan underneath it. Both are baked together. When chilled and then inverted to unmold, the sauce pours over the custard and is served as is. The typical favoring is simply vanilla but there are numerous variations that include almonds, pistachio, orange, pumpkin, coffee, lemon, and various other fruits. My wife, Kimberly, has been making creme caramel (flan) for years, probably because I love it. We've tried many other recipes, but this one is a keeper. It's smooth and creamy with a wonderful caramelized sugar sauce. We hope you try it, and share this recipe with others. Preheat oven to 325˚F. In a large bowl, with a wire whisk, beat eggs with sugar, salt and vanilla to mix well. Gradually add milk, beating until smooth, not frothy, and set it aside while you make the caramel sauce. Pour 1/2 cup of white sugar into a small pan. Cook slowly over very low heat, stirring occasionally with a wooden spoon, just until sugar melts to a golden syrup. If the sugar is cooked too long and at too high a temperature, it will be too dark and taste burned. Immediately pour syrup equally into the bottom of each ramekin. Allow ramekins to cool for at least 15 minutes. Fill a high sided roasting pan with 1 inch of boiling water. Place the 6 ramekins in the pan. Carefully pour the custard mixture on top of the caramelized sugar in each ramekin. Place the baking pan on the middle rack in the oven. Bake for 45 to 55 minutes, or until a paring knife inserted halfway between center and edge of custard comes out clean. Do not over bake; custard continues to bake after removal from the oven. Remove the ramekins from the hot water to a rack to cool completely. Custards can be covered with plastic wrap and refrigerated for up to two days. The custards will settle slightly while cooling. To unmold, slide a paring knife around perimeter of each ramekin, pressing the knife against the side of the dish. Hold a serving plate over top of ramekin and invert; set the plate on the work surface and shake the ramekin gently to release custard; the caramel sauce will run down the sides of the flan. Serve immediately. Makes 6 individual flan servings. Combine the nuts, sugar and cinnamon in a baking dish, mix well and bake in a pre-heated oven at 300˚F for 15-20 minutes. Pour in the mango pulp and again bake for 10-12 minutes. Serve warm over pound cake, ice-cream or by itself. Garnish with fresh mango slices. Makes 4 servings. Combine butter, brown sugar and cinnamon in a bowl and cream the mixture until it is soft and creamy. Using a knife, spread an even layer of the creamed butter mixture on both sides of each pineapple slice. Grill the pineapple slices on both sides until they are lightly browned. Pour the brandy in a ladel and warm it lightly. Pour over the pineapples and set it on fire, allowing them to get flambéed. Serve immediately with a scoop of vanilla ice-cream. Makes 4 servings. Note: You can also use bananas with the same marinade. People on Moloka'i grew up eating local avocados, but when I ask around, most like to eat it with sugar on it, or as a dessert. This frozen dessert recipe is kind of like a key lime pie but with avocado added. Very easy to make, and a good dessert served after eating a spicy Mexican meal, or whenever you feel like it. Puree the avocado in a food processor or blender. Add the lime juice, lime zest, cream cheese and sweetened condensed milk and mix until well blended. Pour into pie crust and freeze at least 2 hours, 4 is better. Thaw for 10 minutes before serving with whipped cream around the outside edge of the pie, with thinly sliced lime quarters evenly placed in the whipped cream, then sprinkled with toasted, shredded coconut. Makes 8 servings. 46,000 Chinese immigrants came to Hawaii in the mid-to-late 19th century. Although many came as laborers for sugar plantations, they concentrated on getting their children educated. 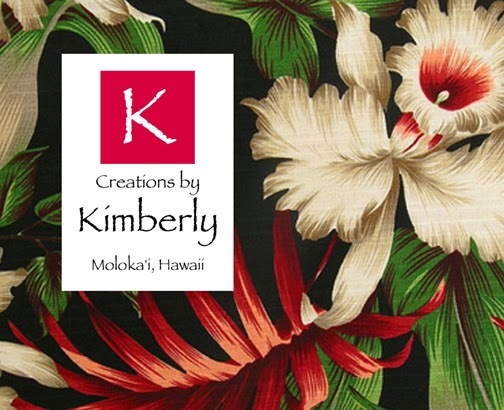 When their contracts expired, many decided to remain here and opened businesses in areas such as Chinatown on Oahu. Today, 1/3 of Hawaii's population can trace some Chinese heritage in their family tree and about 4% of the population is 1st generation Chinese. The Chinese have made great contributions to Hawaii's multi-ethnic society and are proud of their many accomplishments. One of those contributions is their cuisine. Chinese food didn't become popular until the 1920s when young cosmopolitans considered it exotic. It wasn't until after World War 2 that Asian cuisines (notably Chinese, Japanese and Polynesian) piqued the interest of mainstream America, foods like egg rolls, fried rice, chicken chow mien, Americanized chop suey served in paper buckets, and of course the fortune cookie. It wasn't until much later that America discovered just how good real Asian food is, like Peking duck, sushi, edamame (salted soy beans), five-spice powder, tamari sauce, stuffed dumplings, ramen noodles and salted duck eggs... that's right, salted duck eggs. 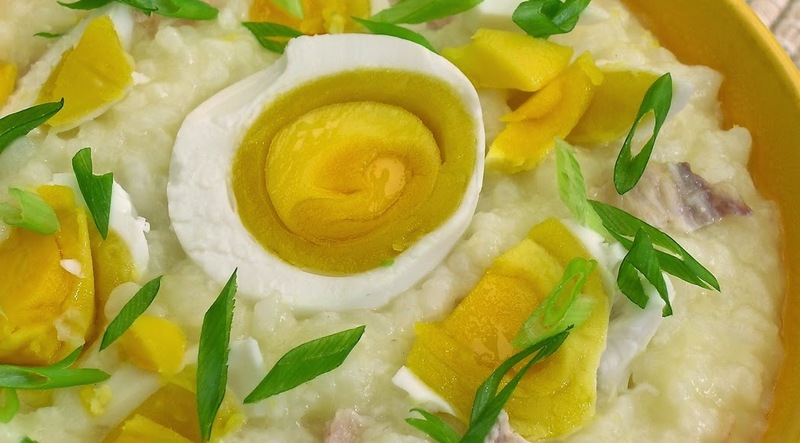 The Chinese have been preserving duck eggs for centuries, and it is considered a delicacy. They contain rich nutrients such as fat, protein, various amino acids, calcium, phosphorus, iron, various trace elements and vitamins that are needed by the human body and they are easy to absorb. Originally in China, salted duck eggs were prepared by wrapping the fresh eggs with a mixture of salt and charcoal or clay. Today, it's simplified, the eggs are simply put in a plastic or glass container, salt brine is poured over the eggs, spices are added, and left for 3 to 5 weeks, refrigerated. At that point, the eggs have a perfect balance of oily yoke and salty (but not too salty) egg white. After brining the salted eggs must be cooked before eating them. Duck eggs are used frequently in East Asia, and are commonplace in the cuisines of countries such as the Philippines, Vietnam, Malaysia, and of course China. The shells of a duck egg are more porous than chicken eggs, making them perfect for brining, pickling, curing and preserving. There are many ways to prepare salted duck eggs. Iron Chef Mario Batali's "Duck Eggs Over Easy with Fontina on Grilled Bread" (recipe here) looks easy to make, but for me, one of the best ways to eat salted duck eggs is to scrape the contents into a bowl of "Jook" (a kind of Chinese rice porridge, click here for that recipe). Salted duck eggs are also good stir-fried with water spinach or other Asian greens, or on top of sugary cheese breads. The cooked yolk can be tossed with chopped tomatoes, chives, and chili to make a light yolk-tomato dressing, then add chopped whites and eat as a salad, or mix the cooked egg white with minced pork and some fresh ginger, spread that in a shallow bowl and put the yolk on top, then steam the whole thing. Salted duck eggs are also really good diced, mixed with fresh raw tofu and a dash of sesame oil, eaten as a cold accompaniment to steamed rice. Or finally, "Joong", a Chinese rice dumpling made with raw glutinous rice seasoned with salt, mixed with split mung beans and stuffed with salted duck egg yolk, sliced lap cheong, cured pork belly, dried shrimp, and dried shiitake mushrooms then boiled (recipe). You can sometimes find fresh free-range duck eggs at Whole Foods, or in Chinese markets, or visit your local farmer's market and ask around for duck egg suppliers. If you are lucky enough to live on Moloka'i, call my friend George Chung at 567-6738, he and his daughter raise ducks for their eggs, or call Robin and Dano Gorsich at Waialla PermaFarm at 558-8306 for home delivery of duck eggs and fresh organic vegetables. Note: Ducks are seasonal layers, much more dramatically so than chickens. According to the American Livestock Conservancy, Campbell ducks lay up to 340 eggs per year and several other duck breeds can lay over 250 eggs per year. That is about 30% more eggs than chickens lay. Check every egg to make sure there are no cracks on it. Rinse the eggs and wipe them dry with tea towel then refrigerate until you are ready to brine the eggs. Hours before you wish to make salted eggs put water and salt in a medium saucepan. Bring the brining solution to a boil. Once the salt completely dissolves, turn off the heat. Let cool completely. Place 1 tablespoon of Szechuan peppercorns in each jar. Then add 2 star anise corms and 2 chili peppers into each jar. Then take each jar in hand and tilt it horizontally. Slide the cleaned uncooked eggs gently into the jar. You should be able to fit 6 eggs into each quart jar. I leave at least 1 inch of space from the rim to ensure that the brine covers the eggs completely. If you are using a large glass jar and the eggs float to the top, place a ziploc sandwich bag filled with plain water and sealed, on top of the eggs to weigh them down into the brine. Cover with lid. There will be leftover brine. Pour the brine into the containers and cover the eggs. Tightly cover the containers and let sit at room temperature for 15 minutes or so, as the brine begins to permeate the egg shells. Label the start and finish dates on the containers. Then place in the refrigerator for at least 1 month. After 20 days, place one egg in a small pot and cover it with water and a teaspoon of white vinegar (the vinegar helps to keep the shell from sticking to the egg when you peel it). Cover the pot and bring it to a simmer for 30 minutes. Peel and taste the egg. If the egg is not salty enough, leave the rest to brine for a few days more. If you’re satisfied, drain the rest of the eggs and wipe dry. Keep them in the fridge, they can be kept for a few weeks, or up to 1 month. Note: You can brine the eggs with just salt and water, usually 1 cup of sea salt to 4 cups of water, however there are many ways to flavor the brine. Szechuan peppercorns and star anise are just the most commonly used traditional ingredients. Other ingredients to add include, a bit of peeled garlic or ginger, or a different spice mix. Some people also add a bit of rice wine to reduce the odor of the eggs and to keep bacterial growth to a minimum. This recipe can easily be doubled or tripled. Brine may be used for the next batch. Fill a medium bowl with water and grate the potatoes into the water. When done, remove the potatoes from the bowl and squeeze out all the excess moisture. 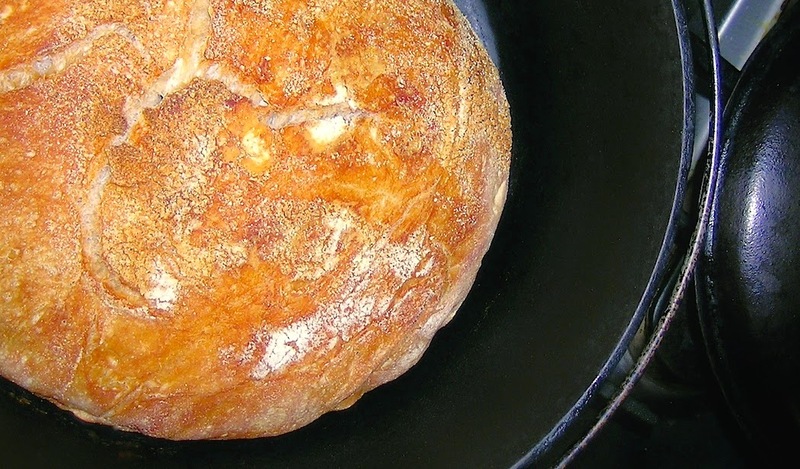 Add half the oil to a large cast-iron pan and heat over a medium flame. Add the potatoes and cook for 3-4 minutes, then add the onions and carrots. Cook and stir the hash until it begins to brown. When the potatoes are a medium caramel color, add the cabbage, chili flakes and additional oil. Season with salt and pepper to taste. When the cabbage softens, remove the pan from the heat. In a small pot, bring three cups of water to a simmer. Add the vinegar and a pinch of salt. With a spoon, swirl water in a circular motion to create a whirlpool. Crack the egg into the center of the whirlpool, turn off heat and place a lid on the pot. After 4-5 minutes, remove the poached egg with a slotted spoon. Repeat with the second egg. To serve, place half of the hash onto a plate and place a poached duck egg on top. Garnish with chives and chili flakes. Makes 2 servings.